When my nephew was an infant, I bought him a couple of onesies in jet black and navy blue. Turns out he looked fabulous in dark colors, and he didn’t have to wait till adolescence to discover it. 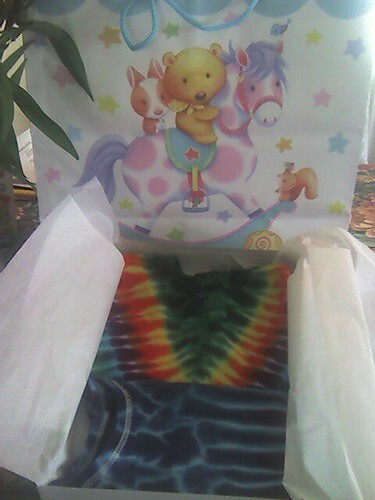 I love the tie dye thing you got your nephew/niece- very Blue State. Do you know the gender yet? It’s a boy. HIs parents are being very tight-lipped about the name. If they’ve made a decision, it won’t be shared unitl the kid is born and it’s definitely not open for debate. Congrats on your aunt-ship! Or is that aunty-hood? Congrats either way.